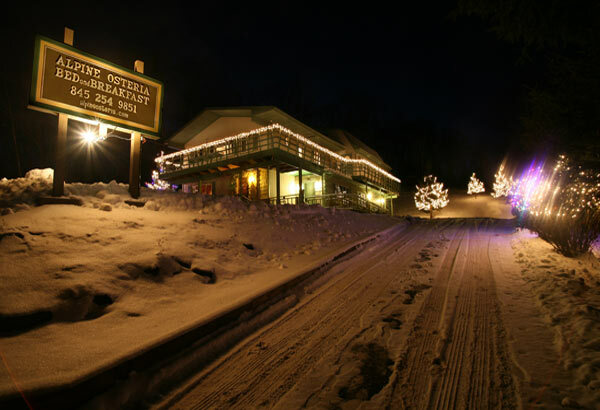 The Alpine Osteria is a small, cozy B&B, catering to singles, couples, families of all sizes, and groups. Best known for our attention to detail, we strive to provide our guests with more than they have come to expect from a B&B, including our promise that you will be very hard pressed to find a cleaner place anywhere. Our eclectic mix of rooms include such amenities as Jacuzzi tubs, two-headed showers with side jets, in-room fireplaces, and wall to wall carpeting. As an added bonus, most rooms are extremely quiet. To add to your visit, all room reservations include a full, hearty breakfast prepared and served by CIA (Culinary Institute of America) trained staff. We do not cut corners where food is concerned...you will enjoy the best possible name brand products, prepared properly and in a timely fashion to get you off to a great start each and every morning. Those on special diets have no fear...we will take care of you!